Sauces in the supermarket usually contain sugar (dextrose), oils, fruits, starches, preservatives and other ingredients that are not friendly to oil-free diets like the HCG Diet, Shape Reclaimed, Nutrimost, etc. Any ingredient that ends in -ose, -tol, or dextrin should be avoided while on this type of diet. Simple Girl has luscious, no added sugar sauces that you can use on the HCG Diet and beyond. Try these simple ideas for all our sauces to add flavor to your meals. You can rest assured that our sauces are not only diet-approved, but they are healthy as well as delicious. Tomato sauce can be used as one of your vegetables for the day. Use it to pour over your chicken or steak. If you want to warm your bones, try it as a soup on the side or cut up your protein and add it to the sauce. Make sure your sauce contains zero fat, zero preservatives, no added sugar, and no artificial sweeteners. 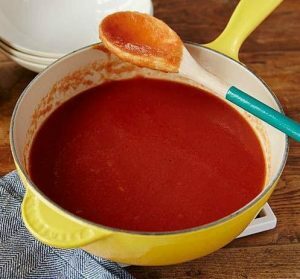 Tomato sauce can be added to your lean ground beef or veal to create a meaty chili soup. You might want to sprinkle some Simple Girl Southwest Seasoning on the meat before adding it to the sauce for an extra spicy southwestern taste. Make sure your tomato sauce does not contain fat, preservatives, added sugar or artificial sweeteners. The Simple Girl Carolina Kick and Southern Blend barbeque sauces are a must on the HCG Diet. Try these sauces on beef, chicken, and even seafood. One of the most popular ways to use these on the low-calorie phase of the HCG Diet is on chicken. Try shredding your chicken and then add the sauce. You can easily shred cooked chicken with a hand mixer or use 2 forks. Both BBQ sauces are free-use condiments on the HCG Diet. It is also delish on steak, veal and fish. The Carolina Kick and Southern Blend BBQ Sauces contain no fats or sugars and have only 5 calories and 1g carb per serving. The Simple Girl Hot Sauce has a wonderful spicy flavor with just the right amount of heat. It is tasty on chicken, steak and fish. This sauce is gluten free, vegan, contains no MSG, has 0 fat, 0 carbs, 0 calories and 0 sugars. Click below to try Simple Girl’s mouth-watering sauces now.